During the monthlong Mardi Gras season in Mobile, Alabama, the birthplace of Mardi Gras in America, over 30 parades roll through the downtown streets, each featuring a dozen floats. MoonPies missed in the air are still in play once they’re on the ground. As Mobilian Carrie Dozier explains, her MoonPies weren’t “… caught in the air, but by scraping my fingernails like a rake on the pavement. It didn’t hurt! All that mattered was that I got a MoonPie!” Dozier even claims that MoonPies “from the parades have a different taste. These are the real things!” And when MoonPies land “tauntingly outside the traffic barricade,” notes parade-goer Kim Kearley, they are retrieved “by savvy children able to perform the fluid ‘under-the-barricade leg scissor.’” Less agile types bring rakes. Mobile is serious about MoonPies. But how did this beloved Southern snack from Tennessee find itself at the center of Mobile Mardi Gras? First, a bit of MoonPie history to get us up to speed. MoonPies were first produced in 1917 at the Chattanooga Bakery. Made from graham cookies, marshmallow and chocolate, MoonPies were one of 200 items made at the bakery, but they quickly became a top-selling product. The original MoonPie was more than four inches in diameter and sold for a nickel. Because it was affordable and filling, it was especially popular among the working class. Similarly, in 1934, the Royal Crown Company in Columbus, Georgia began selling RC Cola in 16-ounce bottles instead of the usual 12-ounce, also for a nickel. With the MoonPie as the biggest snack cake for a nickel and the RC Cola as the biggest soft drink, together they became a popular 10-cent combination, especially as a workingman’s lunch. Though neither company made any effort to link the two products, the phrase “an RC Cola and a MoonPie” became well known across the South, bolstered by the 1951 hit country song “Gimme an RC Cola and a Moon Pie” by Big Bill Lister. By the late 1950s, according to David Magee’s 2006 book, MoonPie: Biography of an Out-of-This-World Snack, the MoonPie had become so popular that the Chattanooga Bakery produced nothing else. Around this time, MoonPies made their debut as throws in Mobile Mardi Gras parades. But the identity of the thrower of the very first MoonPie is up for debate, and several local legends have sprung up around it. One claims that children on the Queen’s float in the Comic Cowboys parade were the first to throw MoonPies in a Mobile Mardi Gras parade in 1956. Another gives the honor to Jerry Curran, who rode in his first parade in 1958 on an Infant Mystics float that carried several employees of Smith’s Bakery, who tossed wrapped bakery products like coconut balls and cupcakes to the crowds. Before the next year’s parade, Curran visited Malbis Bakery, where his father worked, to ask if they had anything good to throw for Mardi Gras. Malbis made their own version of MoonPies, which Curran threw the following year, in 1959. 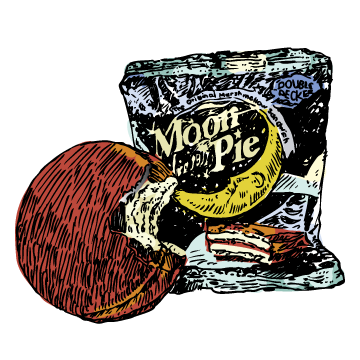 Referred to by his nephew, Glen, as “the granddaddy of MoonPies,” Robert “Bob” Harrison is also credited with being the first to throw the MoonPie. In 1967, Harrison was talked into joining the Stripers, but had little money to spend on throws. At the time, he worked as a distributor for the Murray Biscuit Company and could obtain MoonPies at a low cost. He brought boxes of MoonPies to the float — he was a little embarrassed to do so, but the crowd loved them — and the next year, all of the Stripers threw MoonPies. Yet another legend credits the Maids of Mirth with throwing the first MoonPies in the late 1960s. As the story goes, Louise “Sister” McClure and Elizabeth “Dibber” Lutz went to Tom’s Candy Sales in search of something different (and less costly) to replace the full-size candy bars they had thrown in the past. McClure relates that MoonPies “were so cheap — two or three boxes for a dollar, a lot less than some throws. We didn’t even try to get a deal from the store — we just bought a dozen or so boxes and started throwing them. They were easy to throw. You could take hold of the cellophane and flip them just like a Frisbee.” The crowd loved the MoonPies, especially the children who could easily catch them, so the next year, everyone on the float threw them. The crazy thing about these legends is that they’re likely all true! By the 1960s, Mobile’s Mardi Gras season was two weeks long and featured 17 separate parades, each with numerous floats, making it highly likely that different people on different floats in different parades all began throwing MoonPies (or local versions of them) at around the same time. Yet, regardless of who threw the first one, how did MoonPies rise to dominate the throws and become a staple and symbol of Mobile Mardi Gras? To understand this, we have to look back at throw history. Early Mardi Gras throws, dating to the 1800s, were French bonbons or trick prizes like small bags of flour that burst when caught. These were eventually banned, and throws did not play much of a role again until after World War II, when they became an increasingly integral part of Mardi Gras parades. In the 1940s and 1950s, taffy candy and serpentine (rolls of unraveling confetti) were the most common throws, and it was considered a feat to catch a whole roll of serpentine. “Throw me a whole roll, Mister!” became a common parade shout heard on the route. In the late 1950s, city officials banned serpentine, claiming that people choked on it, but some Mobilians insist the serpentine actually choked the gutters — not people — and thus was a chore for the city to clean up. To replace the serpentine, float riders began throwing new items like rubber balls, beanbags, candy kisses, doubloons (coins bearing mystic society insignia), bags of peanuts, bubblegum, hard candies, Cracker Jack and, of course, MoonPies. Over the next few decades, MoonPies grew into a Mobile Mardi Gras institution. Today, each float rider throws roughly 900 MoonPies during a single parade, estimates Stephen Toomey, owner of the primary Mardi Gras supply store in Mobile, Toomey’s Mardi Gras. Toomey’s alone sells 4.5 million MoonPies each Mardi Gras season. And though the streets are littered with beads at each parade’s end, there are usually no MoonPies to be found. For months after Mardi Gras, Mobile children find MoonPies in their lunchboxes and trade each other for favorite flavors. Local newspapers and magazines print MoonPie recipes. In 2003, Doris Allinson Dean published her booklet Death by MoonPie — a cookbook full of creative ways to consume post-Mardi Gras MoonPies. And on New Year’s Eve in 2008, the City of Mobile sponsored the first “MoonPie Rise,” raising a giant, 900-pound, illuminated banana MoonPie (constructed by Mardi Gras float builder Steve Mussell) over the city of Mobile at the stroke of midnight.